In the southern French Alps between Briançon, Serre-Chevalier and the Franco-Italian border. 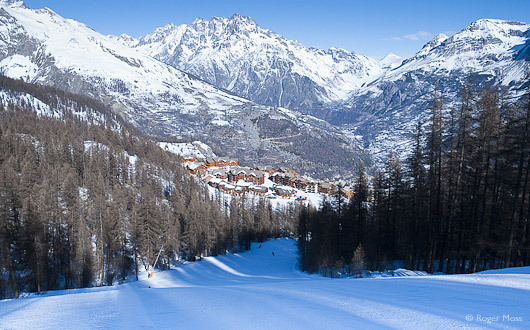 There are quick transfers from Turin or direct high-speed TGV rail services from Paris to Oulx. Driving from the UK is long but rewarded by limitless skiing from a charming, snow-sure resort. Part of the huge cross-border ViaLattea ski area. 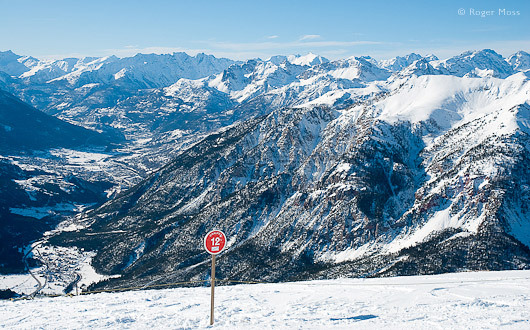 The Monts de la Lune skipass still gives access to the Italian side at Clavière. 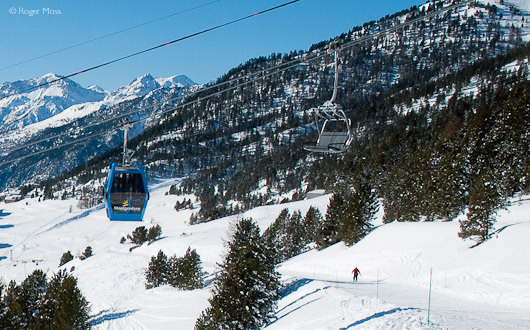 Montgenèvre’s ski area is both varied and extensive. 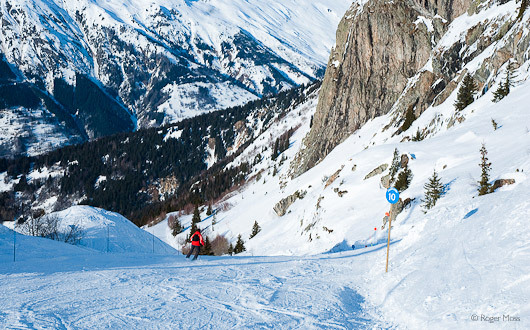 The local ski 75km area includes a huge, safe beginners area on the front de neige. There’s vast intermediate territory on both sides of the valley, in the Gondrans sector and Le Chalvet. The wooded Prarial sector is packed with fairly short but fun reds and sheltered blues. 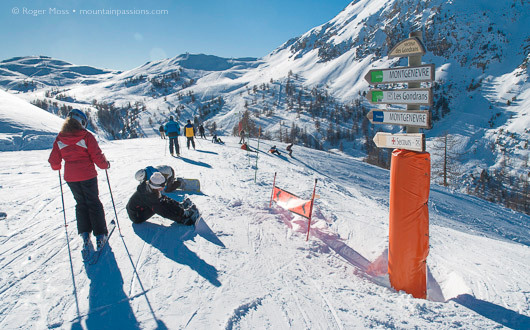 Most skiers prefer to take the Monts de la Lune option (110km) and be able to ski over the border into Clavière, Italy. You’ll need to be a confident intermediate to go over the top via the steep Crete draglift, but the blue runs from Le Prarial are delightful. 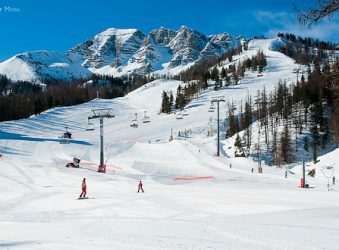 Mile-hungry skiers can explore over 400km of groomed pistes in the international ski domain known as the Vialattea [Milky Way], which links the terrain of Clavière, Cesana, Sansicario, Sestrière and Sauze d’Oulx. Off-piste potential is thus near-limitless. 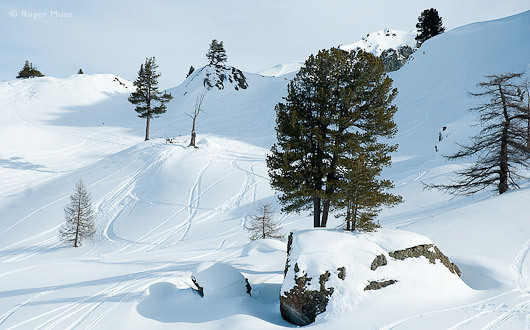 Vars is famed internationally for its freeride terrain and speed-skiing piste. But there’s extensive, varied terrain for all abilities, too. 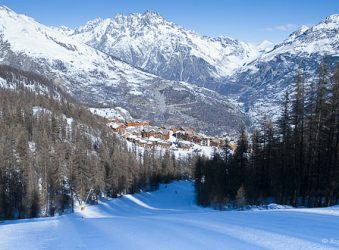 Close to the Italian border in the southern French Alps, Montgenèvre offers limitless, quality skiing for all levels, plus an infectious cosmopolitan vibe. Solid-value family skiing among superb scenery in the Massif des Ecrins. Good range of mostly ski-in ski-out apartments. Galaxie ski pass allows a free day in nearby resorts. 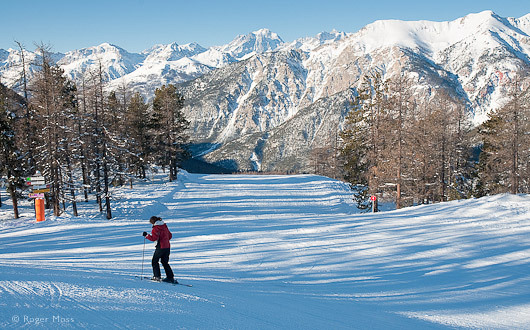 Massif investment has transformed this Franco-Italian border village into a modern ski resort. Expansion into the Hameau de l'Obelisque has brought ski-in ski-out chalet-style apartments and a luxury hotel. Montgenèvre has successfully transformed both its image and its fortunes, with massive investment in accommodation and ski infrastructure. The busy road into Italy has been tucked out of sight underground, leaving the heart of the village practically traffic-free. New chalet style apartments and a luxury hotel restaurant began the expansion into the new up-market Hameau de l'Obelisque area, which has easy access to one of two recent télémix (half gondolas/half chairs) lifts. There’s now a drag-lift from the Hameau de l'Obelisque making it ski-in ski-out. The charming old village exists behind the bars, restaurants and shops which extend the length of the front de neige. 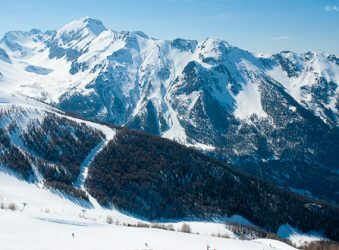 Why go skiing in Montgenèvre ? There’s terrain for everyone here. Families will love the safe environment for children, and even novice skiers can access some of the best and most plentiful intermediate cruising territory on offer anywhere in the Alps. 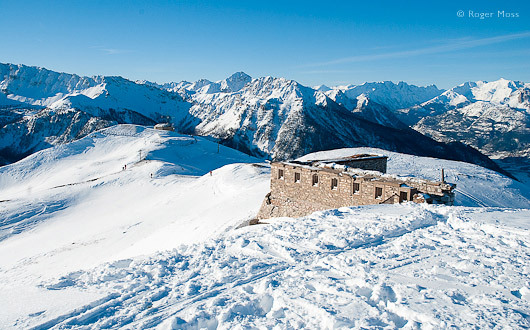 Off-piste opportunities and the option to explore other ski areas make Montgenèvre a top-class destination. Monitored snowpark and freestyle areas, big air bag. Two sites dedicated to cross-country at 1400 and 1860. Half-price ski pass for disabled skiers and their companion (proof required, other conditions apply). Reserved parking near the lifts. Tourist Office has access to information, internet room and adapted toilets. The Espace Partenaires has access to buy ski pass and to public toilets. The cinema and the Maison du Village are accessible. All the chairlifts are accessible. If skiing alone, inform the charlift operators, who are all specially trained to help you. Specialist instruction and loan of Tessier equipment by ESF. ESF at Névache also provides Nordic skiing instruction. Cross-border, linked-domain experience amid stunning scenery. Terrain for everyone, including the bravest free-riders. Accommodation for most budgets, with more on the way. Solid value, without compromises on the ski experience. Short transfers from Turin flights or TGV rail connection in Oulx. Long distances for those driving from the UK. Those venturing further than Clavière might consider driving to Cesana for faster access to Italy, more ski time there and a more carefree return. Ski over the border for lower prices. The Canalino Bar in Clavière serves a large hot chocolate at €3 and an espresso coffee at 1,00€ - a saving of about €1 per drink. Download the free iPhone app. It requires iOS 4.0 or later. These luxury apartments are in a superb location in the Obélisque area of the village. The residence is ski-in ski-out access (snow permitting) and is close to the Serre Thibaud and Chalvet lifts. A few minutes’ walk and you’re in the main village centre. All the apartments are equipped and furnished to an exceptionally high standard and have a living area with a double pull-out bed (making up 2 single beds), a fully-equipped kitchen area, bathroom with wc (some separate). All apartments have WiFi, satellite TV, telephone and a balcony. There’s a cosy main lounge at reception with an open fire, where guests can relax. The Leisure Centre has a free private indoor heated swimming-pool with Jacuzzis, saunas, steam room and fitness room. In the Spa and Beauty Care Centre (payable) you can try a selection of massages and beauty treatments. We particularly like the location of the residence, with such easy slope access, plus there’s a first class bakery, delicatessen and choice of ski hire right on the doorstep. With each new development MGM raises the bar for on-mountain accommodation and the Chalets des Dolines, is no exception. These chalet-style apartments enjoy a privileged piste-side position which is effectively ski-in/ski-out. Facilities include swimming pool, Jacuzzi, sauna, hammam, etc. Very well-equipped and comfortable, the résidence also offers secure underground parking (extra charge). Free wifi available in reception area. It’s a short walk into the village and there’s a convenient delicatessen which offers a take-out meal service, boulangerie/café and equipment hire nearby. Prestige contemporary style hotel offering guests spectacular rooms, concierge service and the latest in spa facilities. The gourmet restaurant La Table Blanche offers sophisticated and seasonal local cuisine. Balnéo spa pools with hydromassage, sauna, hammam and well-being treatments combined with luxurious treatment area with massages, beauty and aromatherapy on offer. Opened in 2014, Durancia offers the latest in spa design and relaxation with the added bonus of an on-site bar and restaurant with panoramic view. Set at almost 2000m, this mountain refuge-style family restaurant serves freshly prepared Italian favourites for all tastes including vegetarians. Set-price evening meals (reservations required) include return transport in a sled towed by snowmobile. A friendly bar/restaurant with a laid-back style (and free WIFI internet access) make this a popular rendezvous. Sited opposite the slopes, the Graal is also the start-point for the legendary One-Piece Wednesdays, whose participants are encouraged to wear their most embarrassing retro-kitsch ski-gear. The classic route is to drive to Grenoble then via the Col du Lauteret to Briançon and up to Montgenèvre - N.B. We advise checking that the roads are clear before taking this route. A faster, more reliable route is on the autoroute from Chambéry to Modane then the Tunnel du Fréjus briefly into Italy. Follow the N94 back across the French border and into Montgenèvre. It is, however, more costly: allow around 100 euros for autoroute and tunnel tolls from Calais. The nearest airport is Turin, within 1½ hrs transfer time. The Resalp LINKBUS company has launched a new shuttle that connects Turin Airport to Cesana and Claviere on the Italian side of the border, then Montgenèvre to Serre Chevalier Briançon. Running every Saturday and Sunday in season, it will correspond with the major flights into Turin. Prices start from €25pp. The transfer from Grenoble takes around 2½ hours, but could easily be longer in heavy traffic and bad weather. There are three direct TGV trains per day from Paris Gare de Lyon to Oulx (Italy) taking around 4½ hours. Regular shuttles take passengers on the 30 minute transfer to and from Montgenèvre. Somehow the Col du Lauteret, highest and most exposed point on the route from Grenoble, has escaped the previous day’s heavy snowfalls, so what can be a demanding drive is today a pleasure. After dropping down through Serre Chevalier and Briançon we roll into Montgenèvre. It’s immediately obvious where the snow-clouds had been targeting; simply getting to our accommodation at the Le Chalet des Dolines, between high walls of freshly-bulldozed snow, makes us glad we have snow-tyres. The sun is also sinking slowly, with the promise of fine weather for the coming week. Sure enough, the following morning finds us gliding off from beside the Hameau de l’Obelisque area of the village down to the Serre Thibaud ski lift in still-freezing temperatures, beneath a steely blue sky. The high-speed ‘télémix’ lift combines six-seater chairs with gondola-style cabins and has opened up some very worthwhile new terrain. It will become even more so as the plan to extend the terrain into nearby Mont Chaberton advances during the next few years. …rising through natural forests of pine and larch which eventually give way to spectacular wide open powder bowls as-yet tracked by a only very few off-piste skiers. At the top there’s the option of cruising all the way back down to the valley floor, but we’re powerless to resist the huge views unfolding before us all the way to Sestrière and beyond. From Le Chalvet (2630m) Briançon appears far below, dwarfed still further by the dramatic backdrop of les Briançonnais mountains. The first few tracks appear on the irresistible fresh snow below the Rocher de l’Aigle, gateway to the Monts de la Lune. From the top we warm up on Pharo and then Suffin, blue-graded pistes which between them create a satisfyingly long, gentle descent back to our starting point. Later we’ll discover that the new lift offers back-door access to the neighbouring Italian resort of Clavière via Baïsses, another long, blue cruiser whose graceful plunge through a deep valley after which it is named enters silent woodland trails lower down. For now, though, we follow the main cross-border link indicated on the piste-map. The Tremplin chairlift hauls us to Le Prarial (2048m), where we ski down to the next lift – the Brousset fixed four-seater. This drops us at 2202m, for a quick schuss down to the Rocher de l’Aigle chairlift. At the top we ski off at 2586m. Getting to the cross-border ridge has been simple enough, with just a couple of lift changes, all the while rising through natural forests of pine and larch which eventually give way to spectacular wide open powder bowls as-yet tracked by a only very few off-piste skiers. At the top there’s the option of cruising all the way back down to the valley floor, but we’re powerless to resist the huge views unfolding before us all the way to Sestrière and beyond. 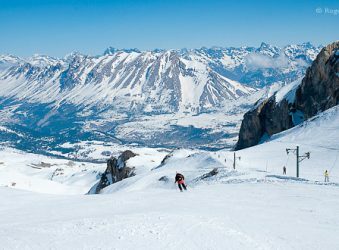 Grand Montgenevre offers access to the north and south sectors of Montgenevre and 3 lifts in the neighbouring resort of Clavière in Italy. 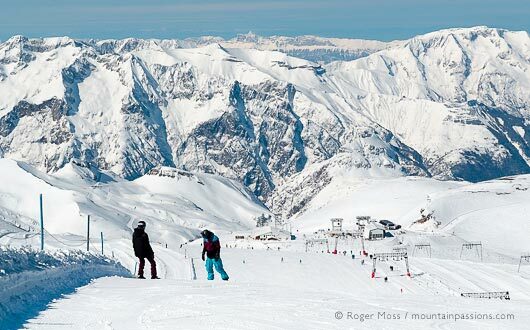 Montgenevre boasts a huge beginners area, accessible cross-country skiing and a half-pipe. Monts de la Lune offer over 110km of cross-border skiing in Montgenevre, Clavière and Cesana. The chance to seek out some great Italian restaurants at leisure. Via Lattea is really for those who love to get some distance under their skis with over 400km of pisted terrain to explore in Montgenèvre, Claviere, Cesana, Sestriere, Sansicario and Sauze d’Oulx. Intermediate territory on the Italian side of Montgenèvre, Monts de la Lune. Easy pistes taking skiers back to Montgenèvre. An exhilarating onward plunge takes us into the Monts de la Lune sector, through which we glide silently in a Zen-like state with not another soul in sight. Our passion for skiing is fired by moments like these. After a sudden brief plunge into the tree-line we let the skis run through winding forest tracks, with a final burst to clear a flat spot which heralds the drop into La Coche, the perfect Italian lunch-spot. We emerge from the restaurant an hour later, smiling and fuelled for any challenge, but it takes just a couple of minutes to drop down into the compact but charming ski village of Clavière. From here it’s hard to believe that Montgenèvre lies just a kilometre or so up the valley – and as we’ll discover, you can be back across the frontier in no time via a choice of routes. We decide to take a brief stroll up to Montquitaine, an old two-seater fixed chairlift which drops us neatly onto our old friend Suffin, for a gentle cruise back to the hotel. The remains of a high-altitude Ligne Maginot border fort look even more melancholy amid a snowy landscape. 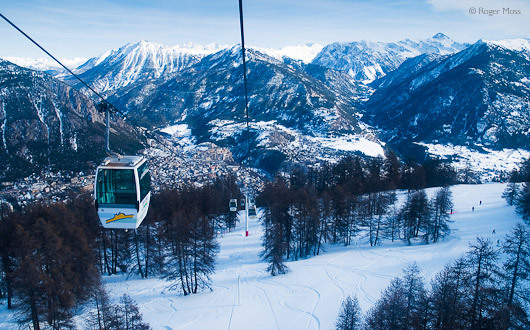 The Serre-Thibaud telemix chairlift combines gondola cabins with chairs. This near-perfect circuit will become a favourite during our stay — which isn’t to say that nothing else comes close. Each new area we explore leaves us simply bowled over. Les Gondrans, for example, begins beside an forlorn Ligne Maginot fort and offers lots of wide open cruising, with a half-pipe along the way. 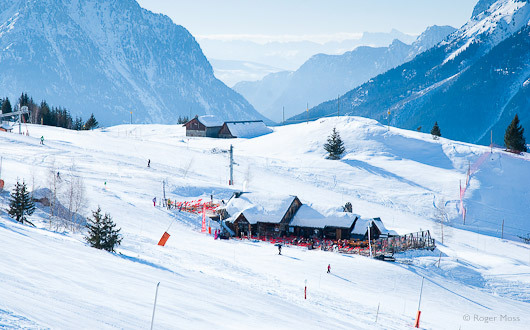 Le Chalvet, on the other hand, has top-of-the-world panoramic views, with a mountain restaurant at the foot of its steep-and-deep Red and Black pistes. But heroics aren’t for everyone, and anyway even heroes need to wind down sooner or later. ‘Serene’ probably goes some way to describing the much gentler Sagna Longa area between La Coche and Cesana — to which we’d have to add ‘desirable’, judging by the array of showpiece chalets sited in just about the perfect setting. By now you’ll have guessed the thought which enters our mind repeatedly during our time here: it’s hard to believe the sheer variety of skiing to be enjoyed with a Montgenèvre/Monts de la Lune lift pass (and the full Vialattea pass adds a whole lot more). 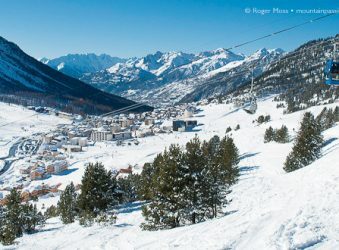 Add the perfect combination of a great snow record, high altitude skiing and 300+ days of sunshine annually and you’ll see why we think you’re going to be hearing a lot more about Montgenèvre.